Le Creuset Round Wide Dutch Oven, 3.5 qt. EXCLUSIVE Le Creuset’s iconic Dutch ovens are perfect for slow cooking, simmering soups and stews, and baking everything from side dishes to no-knead bread. The wide and shallow shape of this oven allows for effectively searing and browning meats before cooking to perfection. A greater surface area is ideal for reducing sauces and evaporating excess liquid. This kitchen classic enhances the cooking process by evenly distributing heat and locking in the optimal amount of moisture. With ergonomic handles and an advanced interior enamel that resists chipping and cleans easily, Le Creuset’s Dutch ovens blend the best of the past with the latest innovations in comfort and functionality. I would love to buy for each of my daughters. The perfect side dish or soup for 2 pan. Great purple color and the utility of the dish is great! All expectations met. Excellent product. Only wish is that i bought a larger one. Very pleased with this item. Cooks well & is very attractive. Love the size and color! Great quality! This dutch oven is perfect for small meals for 2 or re-heating portions. I am also going to try to bake bread in it. Love the new provence color! Love this pan, my fav of all. A Non cook’s must have! There is nothing that can it be cooked in this awesome skillet. Will be getting another! Purchased this yesterday when I saw the great price. Have been a fan of Staub because of the dark interior. Have two Staub a 3.75 and 4 qt. Used my LeCreuset last night. Perfection and cleaned up great. Glad I decided to give this brand a try! Excellent. I use a breville toaster oven and it fits perfectly. Initially, I felt this pot was a bit smaller than expected, and wouldn’t be used so often. Turns out I use it constantly. Love how these pots heat evenly and effectively, and retain heat at low temp. I leave this on top of the stove, as it’s beautiful and used almost daily. this is my favorite go-to for nearly all of my cooking - so much so that I own two and plan to get another. Looks good and performs well. I purchased this purple Dutch oven as a gift for my daughter. She was thrilled with it. The color is her favorite and she has it on display in her kitchen. This particular size is great for many things including making large batches of home-made yogurt! So easy to clean. Great piece of cookware to have in the kitchen. The 3.5 qt is the perfect size for weeknight meals for my family of 4. I have a few pieces, including the 5 qt braiser and a signature skillet. This is my go-to though! I'm really not sure anything more needs to be said. It's Le Creuset and works like a dream. I love the newest color, Provence. It's beautiful and definitely a show piece. I leave it out as a center piece. The only problem is everyone keeps opening it thinking they will find food. Love the color and the size! This is my 3rd purchase & I love every piece! I especially love the color & size of this pan. I use this the most since I am only cooking for myself right now. I love le Crueset and I really like this color! great size for a small roast ! Looks great! Cooks beautifully! Just the right size. I love this shallower Dutch oven. Great for smaller recipes. Provence is a beautiful shade of graduated lavender. Plus, clean up is easy! One of my most used pots stovetop to oven to table, even beautiful sitting out and a open shelf! I am so pleased with with my Le Creuset pot for overall performance on the stove top and in the oven. The flavors and texture of anything I cook come out perfect. I just upset that I didn't start using Le Creuset 50 years ago!! The Provence color is a bit disappointing in person. From the promotional emails and website photos, I thought the color would be a gorgeous vibrant lavender. In person it's more of a muted, grey-toned purple. It's still pretty--just not what I was expecting. I haven't decided yet if I will keep it or not. I do like the 3.5 qt size a lot, however. I have cooked my first dinner it and and it was a hit probably should have gotten a little larger. But I am very happy with my purchase. I bought it for a friend. She loves loves loves it! Hopefully she'll share the bread she makes in it, & lots of other goodies! Love the color and the way it cleans up so nice and easy!!! Perfect size for me and I love the round wide structure. I love all my Le Creuset,pieces, but this color is simply beautiful--wish I could start over and trade in my other colors! Love it. Love le Crueset. Always the best in cookware. Love it. It’s a great size for braising and browning small roasts before adding to an instant pot or slow cooker! Pricey but totally worth it! 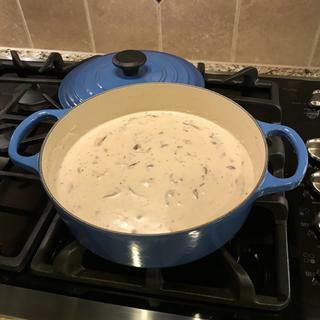 Cream of mushroom and artichoke soup...love my new Le Creuset! Also great for braising! I love my Le Creuset Dutch oven. So easy to clean. Cook faster using lower heat settings. Beautiful design and color (marseille). And most importantly one of the healthiest choices of cookware to avoid any toxic metals leeching in your food. Love ?? Le Creuset. The reputation of Le Creuset is right on the money. This is the perfect size for a weeknight dinner. The cast iron retains the heat beautifully for searing. The enamel makes clean up a breeze. Worth every single penny. I am looking forward to 20 years or more with this piece. Great cookware and in heavy rotation in my home. Using La Creuset for nearly 50 years. I received La Creuset as a gift nearly 50 years ago. My recent purchase off a 3.5 quart is just ideal for my current use. I love the products. I love the way the Le Creuset Dutch Oven makes all of my dishes come out tender and juicy. It's like I can't ruin any meal anymore. TRUE LOVE!!! We've used Le Creuset products for years. They are great products, easy to clean evenly bake each time. My niece is getting married and asked for a dutch oven as a gift. Price - I've been wanting this for a long time. We have a larger one and it has performed well over the years. Was time for a smaller model. Sur la Table was easy to work with and PayPal purchase was quick. This is my first Le Creuset purchase. I've always wanted one and this wider shape looks useful. Also, the color (Provence) is just beautiful. I love cooking in my le creuset and cannot think of a better wedding gift! A friend, who is a great cook, cooks for his family with this 3.5 qt Le Creuset and loves it. Perfect size for family of 4. My husband bakes bread and often likes to make two loaves at once. We already have one of these and it works beautifully, I bought him this new one for Christmas! Excited to add this piece to my Le Creuset collection at such a great price. value for money and i love the colors! Have a knock-off, need a smaller one. Hope its worth it. It was on Carly's request for her registry. Fell in love with the color - dedicated LeCreuset fan and cannot get over the Provence color. i want to have something i can use for stock. I like the size. Can I get it in red? We have the new Breville Smart oven air and this will fit nicely in it. Also, I love the color. The color and the size fit me perfectly. I want to try cooking with the cast iron. I currently have 3 enamel over steel and love them, however never did buy the cast iron due to the weight of the pieces. I received the 7.5 quart for Christmas and also given a gift card so I bought the small one to match. I wanted a smaller sized Dutch oven and the price was right. Elegant an dvery forgiving cookware that is best on the market for a variety of uses. I just got this for my Mom as a Christmas gift, she has never owned any Le Creseut and I thought this was a good size. It seems big enough to handle a nice stew and practical enough to use as an everyday go-to. I have one about this size and I use it for everything. Le Creuset is awesome and I have been using it since I graduated from college after I got my full time job. I have a 2.2 qt yellow dutch oven and now it is time to upgrade to this bigger one for me and my husband. I am very pleased with the quality of Le Creuset cookware and this pan is the perfect size for several of my recipes. I love the color “Provence”. I’ve had Le Creuset pots for 40 years and they still are good. I wanted my daughter to have that opportunity to enjoy Le Creuset. Because of the beauty, durability and reliability of Le Creuset. I needed to add this size Le Creuset to my cookware. Love this color! great sale, been wanting one for awhile. Happy the lilac one is still available. What are the dimensions for this 3.5 qt round wide Dutch oven -- diameter without the handles and height without the lid? BEST ANSWER: 10" x 3"
Does anyone know what this recipe is?? BEST ANSWER: Are you referring to a recipe shown in one of the pictures on the product page? If so, please let us know which picture you are inquiring about. Can this be used on an induction cooktop? BEST ANSWER: Yes. Used mine last night on induction burner. Regarding the 3.5 qt. size, is there a drawback to the wide and shallow dimension? BEST ANSWER: It's hard to think of drawbacks for this piece. But if I have to, I'd have to say The 'wide' part is not that wide. The 5 qts. Version is wider. If you pan fry things in it, the oil might splatter compared to a regular ( deeper) Le Creuset round Dutch oven. I would say no, generally. It does have some limitations with either larger food items or greater overall quantity. I feel it makes up for that with its versatility for smaller quantity braising and sautéing. Very performant for those. I find the dimensions a plus: more surface area for searing and preparing meals for larger numbers, and the shallowness allows for broiling on higher rack in oven to finish off various dishes, especially chicken. It doesn’t seem too shallow. It’s one of my go-to pots. Obviously it’s heavy, but that’s pretty typical of le Creuset. I love mine. No drawback at all. I love this cookware! What does the number 28 on the bottom of my dutch oven mean? BEST ANSWER: The number refers to width rather than capacity -- it is the inside diameter in centimeters, so 28 would be 28 centimeters. If that is on the regular-sized Dutch oven, that would be the 7.25 quarts. But if the pot is a different height (such as the wide or shallow ovens), it would be a different capacity. The number 28 stands for 28 cm which is about 11".....that should be the width of the dutch oven without the handles which corresponds to a 7.25 qt dutch oven. Can you use this on the stove top or just in the oven? I am looking for an all in one pot to make pasta dishes etc. BEST ANSWER: I love this piece...Not only is it beautiful, yes you can use it in both applications. I've made a wonderful Cassoulet Stoup on the stove, an amazing Bison Pot Roast in the Oven and a Yorkshire Pudding in the oven as well. The Dutch Oven also works great to start on the stovetop and finish in the oven. You will not be dissapointed. In fact, I would love the next size up to add to my collection! Yes, you can use this pot for both! I carmalize onions and brown beef in it on the stove, make a roux, and pop it in the oven. This is a fabulous pot!!! I'm actually on my second one because after 40 years, my first pot was getting quite worn inside. I use at least once a week all year long for all kinds of recipes! The Le Creuset Dutch Oven goes everywhere! It is wonderful on the stove top as well as in the oven. I love to make pot roast and beef stew in mine on the stove top, and dozens of other dishes. Enjoy! BEST ANSWER: No, it isn’t. However you get fantastic results if you use lower heat and keep some liquid in the pan. For sauté use, use higher heat and stir food frequently to minimize sticking. Use wooden utensil and scrape immediately food that is starting to stick. Works well for searing, braising. No, not in the Teflon-sense of non stick, but it's easy to clean. it will develop a nice browning/fond /caramelization for umami when you cook something in oil and pour in a liquid (water/wine/ broth) later to scrape out the brown bits with a wooden spatula. With amazing flavor. So wonderful to cook with. Not like a traditional non stick pan, but the finish is very nice and not difficult to clean. No it is not nonstick but this cookware holds the heat so well. I love every piece I have. It is not non-stick but easily cleaned. For stubborn stains I use a little baking soda. No, not a non-stick coating, but very easy to clean. The enamel interior is NOT nonstick. Can you bake a loaf of bread in this model? BEST ANSWER: My husband has made "no knead" bread in our dutch oven a number of times. Recipe available on-line. Is the new lavender color pots under the name lavender or is it under another name?i can't see the colors clearly in the blocks? Is Provence the lavender color? BEST ANSWER: Yes, the name of the color is Provence. Is there any Advantage to the 3.5qt Round WIDE Dutch Oven -vs- the 3.5qt Braiser... OR vise versa!??? BEST ANSWER: It looks like the braised is not as deep as the wide Dutch oven. If your want to roast a small chicken or a pot roast or a pork roast go with the wide Dutch oven. The braver just looks too shallow. Also I often make soups in my wide Dutch oven because it’s deep enough. The braise looks like it wouldn’t be deep enough. Under the specification tab you’ll see the differences in the dimensions. I think the dutch oven is a little bit more versatile-- for example, I use it to bake nice crusty bread, which would be difficult if not impossible to do in a braiser. I also prefer the higher sides for soups and stews, and I have used it to braise as well, but need to take care to not put too much in as I have less surface area to work. I believe the Dutch Oven is deeper and the Braiser is wider, more like a skillet. The Dutch Oven is a great multi-purpose vessel for my use as I like to make a lot of stews and soups in the colder weather. Hope this helps. The Dutch oven is perfect for stews. It is deeper than the braiser, and you need that depth for browning meat. The braiser is great for layered casseroles. I couldn't do without either! This pot can be used for everything you cook on top of the stove or in the oven. Perfect size for smaller portions (2-3). The dutch oven is deeper. It is good for stews and chili. The Braiser is goof for braising meats. It just depends on what you are preparing. Sometimes you just need a deeper pit. I love all mine! Dutch ovens be put in the oven for cooking? BEST ANSWER: You can use it in the oven, If the lid has a metal knob. If it has the black phenolic lid knob they cannot be used at oven temperature (black knobs are heat-resistant only up to 375°F). Absolutely. I own three. You can also bake bread in them. Yes! I bake in mine all the time. Is this style what other sites refer to as the "essential oven"? BEST ANSWER: Most def! I use it for everything. It’s THE perfect “oven” for roasting and braising things all day in the oven. I also use it to sauté food for one pot meals. It’s my #1 pot at home. It’s definitely one of the pots to own! The larger versions of this pot also are great additions to your kitchen essentials! It certainly is MY essential oven! It makes the BEST braised foods and stews-- better than a crock pot or pressure cooker. It is essential to me! This is a high quality product. I have since bought another in a different size. Sorry. I'm not familiar with the term "essential oven". Hello, do you have any more colors for the Round Wide Dutch Oven 3.5qt. like sea salt or coastal blue? Unfortunately, we only have the lilac(purple) available at this time. What number is printed on this 3 1/2 qt round wide dutch oven? 22? 24? BEST ANSWER: The number I have printed on my new Le Creuset is #24. I was originally looking for a tagine, but I wanted to buy something that I would get more use out of, could this be used as a tagine? BEST ANSWER: I’ve never used a tangine. I’ve used the Dutch oven for everything from chicken dinner to baked mashed potatoes to casseroles. I don’t know the function of a tangine specifically, but the Dutch oven is very versatile. I do not know the specific cooking qualities of a "tagine" but I can tell you that the Le Creuset line of dutch ovens is really and truly amazing--I don't think any kitchen is complete without one or two. What’s the difference between the 3.5 qt wife Dutch over, and the 3.5 qt signature braiser? Thank you! BEST ANSWER: The Dutch oven is deeper and meant for stews and soups -- I also bake bread in mine. The braiser is much shallower, larger diameter, and can brown much larger pieces of meat relative to the dutch oven. I imagine it would be quicker to concentrate liquids in the braiser, as it has a larger surface area from which liquid can evaporate. These pots both serve the same purpose. I like to use the braised for casseroles that have a topping ( bread crumbs, cheese etc) because the pan is shallow compared to the Dutch oven and every serving can have lots of topping. I love it for mac & cheese and seafood casseroles. I use my Dutch oven for stews. I couldn't be without both of them! Is this the Signature series? BEST ANSWER: Yes, it has the bigger handles....note the only difference between the 375 degrees and 500 degrees is the knob. All of the Le Creuset dutch ovens are safe up to 500 degrees if they have the new phenolic knob (it is black but bigger and bulkier) or the stainless steel knob. You can put either the signature series or the classic series in the oven up to 500 degrees...just get yourself a stainless steel knob if it does not have one. Yes, the Le Creuset we purchased is the Signature series. We were most interested in the fact that you can put this model in the oven at 500 degrees rather than 375 degrees for the classic series. I ordered the 3 1/2 qt round wide dutch oven in the Provence color. The box says Blue Bell Pepper and the color is darker then what is pictured. Anyone else's box say Blue Bell Pepper instead of Provence? BEST ANSWER: That's interesting if they are the same. Why would the box not say Provence? Blue Bell Purple (sometimes written Bluebell) had been introduced in Asia previously. I received a reply and they are the same....my guess is that the first batch before the official Le Creuset Provence roll out on February 16th came from batches made originally for Asia. This gives me hope for the Berry limited edition for the USA (now available in the UK). Blue Bell Pepper is another name, but it is in fact the Provence. I am looking to purchase a Round Wide Dutch Oven, 3.5 qt but want one in white.I see that there is one available in the 6.75 qt size but not the 3.5qt size. Is it out of stock? Or did Le Creuset choose not to make a white version of the 3.5size? BEST ANSWER: Sadly, we no longer carry the Round Wide Dutch Oven, 3.5 qt. in White. Hi, Does any owner buy Le Creuset Round Wide Dutch Oven, 3.5 qt. in "Honey Color" ? Please, Could you share any pot photos in Honey Color ? Before make an order, Just want to comfire the color. BEST ANSWER: The image of the Honey dutch oven reflects the product's true color.
" Le Creuset Round Wide Dutch Oven, 3.5 qt. " Is it out off stock ?? BEST ANSWER: No, this is not out of stock. Hi, I need 2, Will these( 2 pot) package in one box for shipment (the same address)? BEST ANSWER: We cannot guarantee shipment in one box. If needed, they will be package separately. Are all of them now come with the metal knob or just the newer one (Provence)? BEST ANSWER: I purchased a blue one in the fall and the handle was not metal. Is it made in China??? BEST ANSWER: No, this is made in France. Is the oyster color in this 3.5 qt round wide Dutch oven going to be available again this year? i was just going to order it! BEST ANSWER: This product in Oyster has been marked discontinued, so it is unlikely that it will be available again. do you still have the color Rosemary? BEST ANSWER: No, we do not have the color Rosemary available.